Store away all your magazines and books! - it's now possible to correctly study the extra subjects (charisma etc.) if there is a "Golden Bookcase" (SSN career reward) in the lot. Bugfix: a rare jump bug occurred when clicking on the racks (see Aelflaed's report here). Tidy up your home! All those magazines that usually clog your house, covering tables and floor, have finally found a nice place to be stored into! You can store in the racks all the base-game magazines, the hobby magazines, the books (including the custom-written novels) and even the unattanded UNI assignments. You can then pick back from the rack any of the stored magazine or book (not the assignments), read it at will, and then put it back into the rack. The magazines, after a number of readings, become "old" and can't be read any more (this apply to the base-game one, too!). 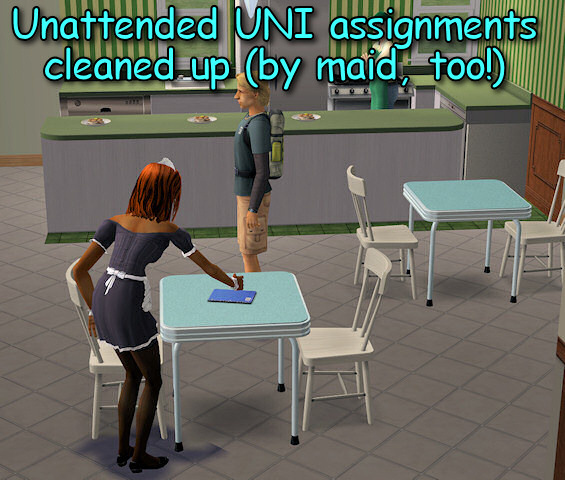 The maid, and any sim "influenced" to clean, will automatically put away all books, magazines and UNI assignments. 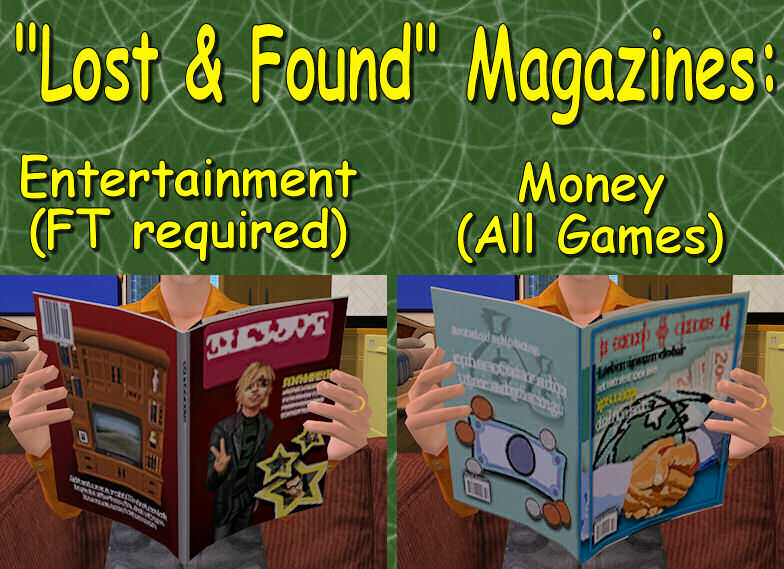 Lost&Found magazines: all the rack by default contain the lost "money" magazine (base-game) and also the lost "Entertainment Hobby" (FT required). 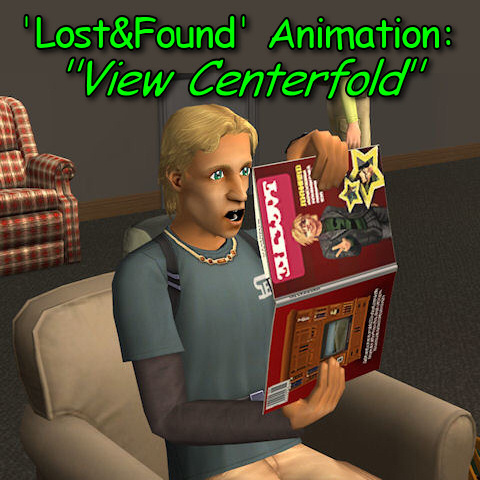 Lost&Found animation "View Centerfold": while reading, the sims will randomly play this funny animation. The Magazine Rack comes in two versions: vertical and horizontal; the horizontal can become a simple pile of magazines by applying the "invisible" recolour provided in the package. The racks are compatible with any game (tested from base-game to Apartment Life). Depending on your game, some additional features may become available. Automatic clean-up by sims "influenced" to clean. DON'T try to sell books in your store using this rack; and don't try to sell the rack itself: the OFB functions are disabled and won't work This is a residential object, after all . You can study the 5 new skills. Note: Multiple racks - You can put as many racks as you want in your house, but they work as in real life: if you store a magazine into one rack, don't expect to find it in all the other racks! On the other hand, the standard bookcase functions (reading books, studying books, custom novels) work like the Maxis bookcases: all the books are shared between all the bookcases (including the rack). Note: Pie Menu - Most of the pie menu entries have been modified to make them consistent with the idea of "magazine" (e.g. Study/Parenting has become Browse Monthly Review/"Children: User Manual" ); I only speak English and Italian, and several users helped translating the menu into new languages, but some players might read the usual text. In the attached rar you will find two Racks (horizontal and vertical), and a Magazine. All the three packages must be put in your Downloads folder. NOTE: The Magazine is always required for the Racks to work; on the other hand, if you don't like one of the two racks, you can safely discard it. You can recolour the racks by following two alternate methods. (Preferable) Using the TEMPLATES - Download the recolour templates from this thread; Start Object Workshop, click "Open..." and load the chosen template (racks or magazines); then choose "CLONE" (attention: not "recolour"!) and proceed; when the clone is created, just replace the texture with your own. This method will create ONE recolour package (for either the wooden part or the magazines) that works for BOTH racks at the same time. Following the general recolouring tutorial - Keep in mind that the vertical and horizontal racks are autonomous objects (they don't share the textures) and must be recoloured separately. Start Object Workshop, click "Open..." and load the chosen rack mesh (either the horizontal or the vertical); then choose "Recolour" and proceed. In the subset selection, I recommend to choose only one subset (either "magazines" or "rack"). Finish the recolour following the tutorial. The "vertical" rack is based on a mesh originally created by Boblishman for a different rack (working just as a normal bookcase) and posted here. The horizontal meshes and the internal code were entirely made by myself. - English (by Numenor) - Italian (by Numenor) - German (by Frizelbliz) - Spanish (by Man1968) - Swedish (by Stimy) - French (by SeasonPink) - Polish (by domilika) - Urdu-Romanised (in the Hindi language) (by ieta_cassiopeia) - Japanese (by mijiki-kun) - Norwegian (by Annapast) - Portuguese (by Ocorreia) - Brazilian (by DaniloFTS and Larissamenezes) - Thai (by The T) - Russian (by Shoukeir). Thanks a lot to anyone provided the translations! By now, I don't plan to add more languages. Once again, thank you so much. You are so good to *us*. I am sorry, but it seems that this object stops the maid from doing anything. He/She just stops three squares from this object and then just stand still. I have all the stuff packs and exp packs. Is this a common problem or is it just my game? I tried the rack in two different lots and the maid stop working, when I deleted the rack, she/he started to work again. I hope you take this as constructive feedback, because it is a great object and if it works, it will be one of only five downloads that I actually use. Ford: "you'd better be prepared for the jump into hyperspace. It's unpleasantly like being drunk." Arthur: "What's so unpleasant about being drunk?" Ford: "You ask a glass of water." Eee, I downloaded it. What is it under in Buy Mode? (Im such a noob). This worked, but after I placed it my game crashed. awesome! I had stopped buying magazines because they made the house too messy, but now the maid puts them neatly away for me everyday. You're great! I can't speak read and write english. I'm sorry if you can't understand!. I should have known this would be an amazing post, although I had been ignoring cause I have too much CC. Finally looked at it today and this is amazing!! Now my sims can have the hobby subscriptions back, now I have someplace to put them. I like others was sick of magazines all over the yard. Yay!! I wonder, since you posted that custom written books can be stored. If so, I won't have to worry about losing them when a sim moves. I should be able to pick up the rack in inventory and move them with the book included. I hope so, will be trying it out. Thank you soo much. So exactly what is needed. The small thumbs up button wasn't enough to say how pleased I am to have this in my game. So thanks again. Finally a way to clear up all the magazines without having to buy a bunch of tables to put them on! Yay! "If you can't be kind, at least have the decency to be vague." Amazing job Numenor. I really needed something like that. I cannot take requests now. It's great! I didn't even remember I needed something like this! Thanks! Will this be updated for AL with the new life skills any time soon? Thanks Numenor! - Added 5 more languages: Norwegian (by Annapast) - Portuguese (by Ocorreia) - Brazilian (by DaniloFTS and Larissamenezes) - Thai (by The T) - Russian (by Shoukeir). Thought I should point out you forgot to capitalise one of the new study titles in English. I can't remember which at this moment but thought I should say while I thought about it. I was testing this today and I noticed something. Base game magazines have 3 reading options/subjects (when magazine has not been in rack). However, when Sim puts it in magazine rack and takes it out it only gives “Read magazine” option. Is it supposed to be this way? I'm curious about this because the game only seems to allot a certain amount of interest points so that when you gain interest in one area, you lose it in another. Pescado even has a mod that decreases the loss (interestloss), but still doesn't eliminate it. Because of this I have been very careful when reading magazines, only reading those interests that I specifically want to raise. Because the game's magazines turn into your magazines, does it now bypass this limitation? Will Sims read anything from your rack autonomously? Running: Sims2, Uni, NL, OFB, Pets, Seasons, BV, FT & AL. Patched. I know that I have seen resident Sims Write in Diary autonomously, and I have seen visiting Sims Read Magazine autonomously. I don`t recall for sure, but I believe that I have seen resident Sims Read Book autonomously. Other than that, I don`t recall seeing any autonomous use of the rack, though I can`t say that they can`t. #174 10th Oct 2008 at 11:07 PM Last edited by Numenor : 29th Oct 2008 at 10:26 AM. MagicMoon - I confess this is a problem that I didn't take in account, when creating the magazine rack; I was actually convinced that there was a slow decay in interests, but I didn't know that raising one interest causes a loss in another one. Now I've examined the game routines and I can confirm this, but fixing this would be quite difficult (and would cause the pie menu to become huge!). I can only say that the interest grow is determined by the global game code, not by some code included in the rack; and therefore the interests are managed exactly the same way as the standard game magazines. This means also that Pescado's fix will work with my rack too. I know that this is not enough, if you want to keep full control on your sims' interest levels, but I'm not planning to change this particular behaviour of the rack. If this can help, keep in mind that the magazines will be "Maxis" magazines until they are not put in the rack: if you buy a magazine and never put it in the rack, you'll be able to select the interest to raise. As for the second question, the interaztions of the rack are the same (though with different names) as a standard bookcase; most of the interactions (excluding the "Study" ones) are theoretichally autonomous, but the bookcases (and my rack) don't advertise any fun for them; as a consequence, the sims could read magazines and Freetime books spontaneously, bu never choose to do so. The only interactions advertised as funny (and therefore spontaneously chosen by the sims) are: read a book (generic books), write in diary and read to toddler. 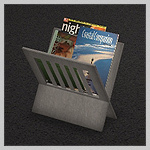 2 MORE Recolours of Numenor's Magazine Rack.